The City of Falls Church, Virginia, is an independent, full-service city six miles from the nation’s capital. "The Little City" is just 2.2 square miles. 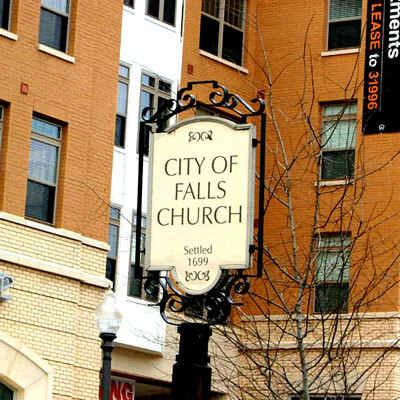 The City of Falls Church is a unique and historic city. Besides featuring quick access to renowned museums and art galleries in nearby Washington, D.C., almost every neighborhood is a treasure of its own with a variety of restaurants and shops that reflect the City’s great ethnic and cultural diversity. Amenities & Landmarks: Wonderful attractions the City of Falls Church has to offer – from historic buildings and cultural centers to gorgeous parks and trails, the Little City has it all! Falls Church and nearby Attractions include Cherry Hill Farmhouse, Fort Ward Museum and Historic Site, Mary Riley Styles Library & Potomac Overlook Regional Park, just to name a few. Economy: Falls Church City has been ranked in the Top 10 Richest Counties in the United States for that past 4 years. It is a thriving and dynamic community thanks largely to its diverse and active businesses. Education: The Falls Church City Schools enjoys a reputation for excellence, and the division is committed to maintaining its standing as the premier small school system in the nation. Our four schools serve more than 1900 students including some tuition students who live in communities outside the City of Falls Church. Thomas Jefferson Elementary School, which includes grades 2 – 5. Mary Ellen Henderson Middle School, which includes grades 6 – 8. George Mason High School, which includes grades 9 – 12. Getting Around: A small portion of the 45-mile Washington & Old Dominion Railroad Trail (W&OD Trail) runs through the City. The City of Falls Church is serviced by WMATA- Washington Metropolitan Area Transit Authority’s Metrorail and Metrobus systems. Though located just outside of city borders, the East and West Falls Church Metrorail stations provide convenient access to Washington, DC. In 2014, East & West Falls Church stations will be connected to points West via phase 1 of the new Silver Line Metro. Phase 2 of the new Silver Line Metro will provide access to Dulles Airport and Loudoun County.